One of my greatest pastimes is to meander through the halls of history museums and, as a nurse by profession, I always spend a great deal of time in front of the medical exhibits. The archaic tools, the vials of powders, a doctor’s entire practice encased in a small leather bag or wooden crate; it all fascinates me. I could spend hours perusing these items from behind the glass walls. Recently, I was engrossed in an exhibit from the Civil War period when my daughter pointed out that all our favorite herbs were in the case in front of us. 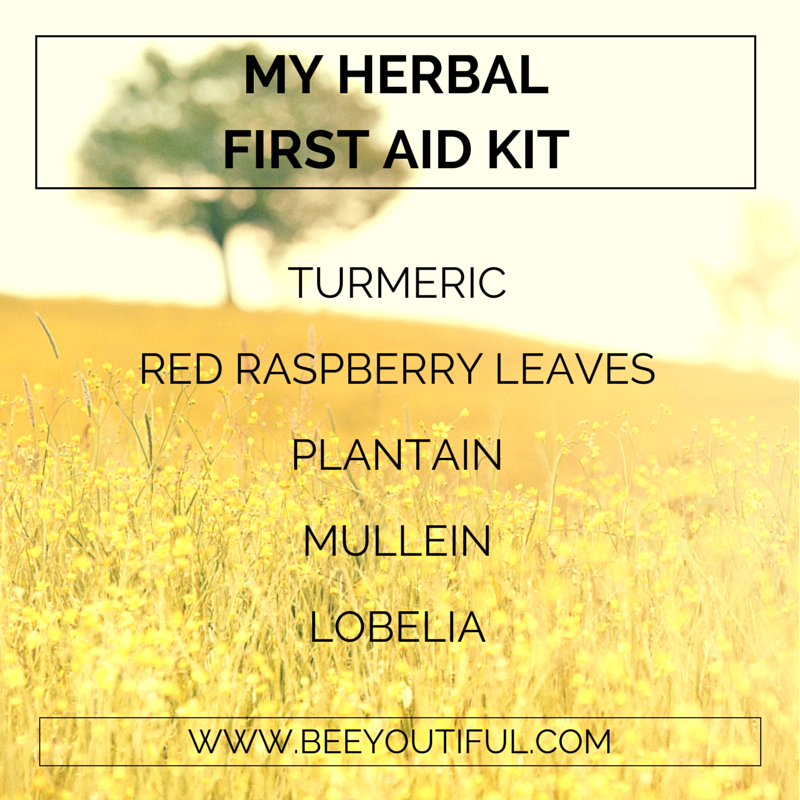 She was tickled pink to see little glass jars of Plantain, Turmeric, Mullein, and Lobelia, as well as two rows of additional herbs. She’s an avid history buff too, and we both were reminded that at home we were using the tools of our great-great-grandparents (and those that came even before them). Here are a few of my favorite ways to use these ancient but modern resources. This beautifully deep yellow powder is rich in benefits. We mainly keep turmeric for culinary uses when we are feeling under the weather, or just for fun because we love spicy Indian food! The main active ingredient is curcumin, which is very rich in antioxidants, making turmeric a great way to boost immunity and soothe your symptoms while sick. We add a teaspoon or two to our soups, especially when struggling with congestion or coughs. We also highly suggest sipping on Liquid Gold Coconut Milk when under the weather; it’s a Beeyoutiful favorite! Another personal favorite! It has long been prized for women, especially those preparing for childbirth, but did you know that red raspberry leaves are also beneficial to your body during periods of colds or flu? While it does not impact the virus directly, the herb has astringent properties which help to soothe throats, aid the body as it clears the mucus, and restore balance. When we’re sick at our house, we limit food intake to fresh fruits and vegetables, and then drink Red Raspberry Leaf Tea liberally throughout the day. To make it more palatable for littles, I occasionally add a bit of raw honey and some frozen raspberries and blend well. Plantain is a first rate “First Aid” plant that is usually close at hand, wherever you may be. While my children love to pick plantain leaves fresh from the yard to chew and then drape over their cuts, scrapes, and insect bites, during the winter months they are not as readily available and the dried leaves come in handy. A cup of strong plantain tea can be drunk to help calm indigestion, and a small wad of the bruised leaf placed next to the gum can have a calming effect on a toothache until it can be attended to by a dentist. Mullein‘s gentle nature makes it one of the very best herbs for use with children’s health challenges. Mullein in the wild is absolutely beautiful; its soft lamb’s ear-like quality just begs to be handled, and is another great herb to grow in your yard to have in plenty! It combines wonderfully with Chamomile, Catnip, and Lemon Balm where appropriate, and can be used to soothe a wide variety of childhood ailments. Mullein has a folk history of use that focuses on respiratory complaints. It has traditionally been used to calm coughs and colds. Mullein is considered the herb of choice for lung ailments; individuals who struggle with ongoing lung issues have reported positively when using Mullein, usually in a tea. Its pleasant taste blends well with others. Steep both herbs in 8-10 ounces of boiling water for 10 minutes. Strain and then take cotton cloth (I have used old cotton diapers and cut them into four inch wide strips lengthwise) and soak them in the strong liquid. Wring out until damp but not dripping and then wrap around the throat. This can be worn for several hours and then switched for a fresh fomentation. This can be used until the discomfort has been eliminated. To protect the clothing or bedding, wrap a piece of plastic wrap over the fomentation to hold it in place, and cover with a soft cloth. This just barely scratches the surface of the benefits that these herbs bring to our lives. Hopefully even this introductory view will pique your interest! For more in-depth information, I invite you to check out Beeyoutiful’s selection of books about herbs (beginning with Nutritional Herbology) and begin your herbal education journey today.